Beautiful Sunday it was! Being able to work with like minded and equally enthusiastic people is a pure blessing. Today, I had volunteered for a fund raising event, the theme was Pakistani brunch. Amazing event, amazing people, had so much fun and my heart is filled with happiness. During weekends, I chat with my sister and niece; my niece never fails to entertain me. She is growing up so fast and getting wiser day by day. Yesterday, when I had a chat with my niece she showed her new posing style. As she can see her video through the webcam, she started to pose for it. She raised one knee slightly up and bend it in towards her other knee, and put her hand on her hip and winked at me. Voila, red carpet pose! My jaw literally dropped when I saw this. I was intrigued and asked my sister how she learned all these. Even my sister is clueless. Kids these days are way too smart and fast learners. Roasted red pepper soaked in vinegar which is available in jars is my new obsession. When pureed, it makes a delicious sauce and anything can be literally combined with it. I had already shared the recipe for making the roasted red pepper and peanut butter sauce. The other day, I had made pan fried chicken and combined mushrooms/spinach and chicken in it. The slight tartness and the roasted flavor from the sauce made this dish taste incredible. I served along with pasta and it was a complete dish. Cut the chicken breasts into long slices. Season with ground pepper and salt. Place a non-stick frying pan over medium heat, add olive oil. Place the seasoned chicken breasts and pan fry till both sides turn golden brown. Keep aside the cooked chicken. Place a large pan over medium heat, add butter, let it melt. Add mushrooms, season with Italian seasonings, saute mushrooms till it turns tender. Add spinach, cook for a few minutes. Add the drained roasted red pepper, cook for a few minutes. Puree the mixture in a blender to a smooth paste. Pour the pureed mixture into the pan, add red chili flakes and cook for a few minutes. 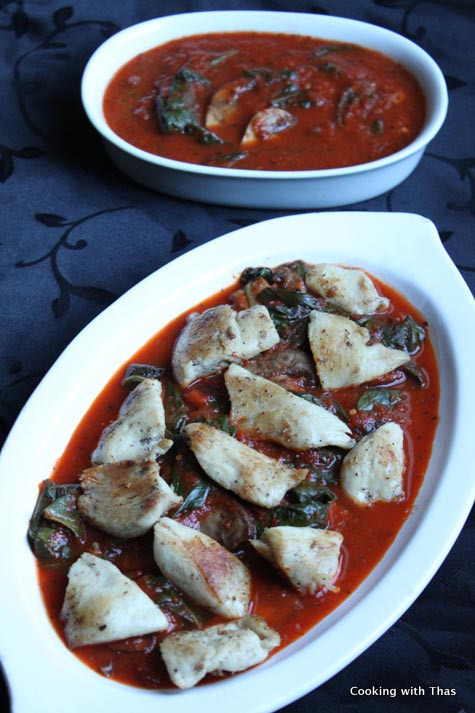 You could either add the pan fried chicken into the sauce and combine with it or pour the red pepper sauce into a wide bowl and place pan fried chicken over it. Serve with pasta or rice or roti. Jarred Roasted red pepper is available at Costco and some other stores.